Comic books have struggled with diversity since Famous Funnies was released in the United States in 1933. However, the past few years have finally seen some cracks in the proverbial glass ceiling as black culture has permeated into the mainstream of the comic book universe. From Marvel’s reimagining of classic rap album covers as comic book covers to the success of Black Lightning, Luke Cage and what is expected to be a massive bow at the box office for Black Panther, minorities in comic books are no longer a rarity in 2018. It’s astounding to consider that it took this long for comic book publishers to recognize the appeal of black characters who are more than just sidekicks and henchmen. But with the buzz for Black Panther and seeing just how much a black character resonated with an audience, the door has been thrust wide open for more black characters who look, talk and act like us to be featured in this medium. The significance of black children and adults seeing themselves in comic books has long been undervalued by publishers. But with a diverse crop of black heroes (and anti-heroes) cropping up and finding success, films like Black Panther will hopefully become the norm and no longer outliers that we have to celebrate because we’re unsure we’ll ever see something like them again. Hill’s ongoing DC Comics series, Michael Cray, is one that will draw its fair share of attention because of the comic’s unique narrative and the fact that it is written by a black man with a black title character and a black artist providing the visual element. Michael Cray is a fascinating story in which the title character is an assassin who exists in an alternate version of the DC universe and is tasked with hunting down evil versions of DC heroes, which include Arrow, the Flash and Aquaman. Hill drew upon his own personal experiences as well as conversations with family and friends who had a military background to mold the personality of Cray. As for Hill’s journey to this point, it’s certainly been one that is unique in its own right. With his father’s untimely death due to cancer when he was 8, Hill desperately needed something to have faith in. After entering a comic book store and coming across a Batman comic that seemed to mirror his emotional weight of losing a parent, the St. Louis native found something to believe in. With St. Louis admittedly not being a fertile ground for breeding African-American writers, Hill grew up enjoying comics but never really considered a career writing comics until later in life. After graduating from New York University film school, Hill worked as a freelance journalist before landing his first comic-writing job with Top Cow Productions in 2010. Since then, he’s worked on a number of comics, including Witchblade, Postal and 7 Days From Hell. He recognized early on that he was a black writer in a predominantly white space and needed to find a way to balance servicing the needs of readers with introducing characters of color. Being at the helm of Michael Cray has been yet another balancing act for the 40-year-old. With a history of black characters being trapped in their own blackness, Hill sought to ensure that Cray was a black man with black experiences, but one who was not defined solely by those encounters. 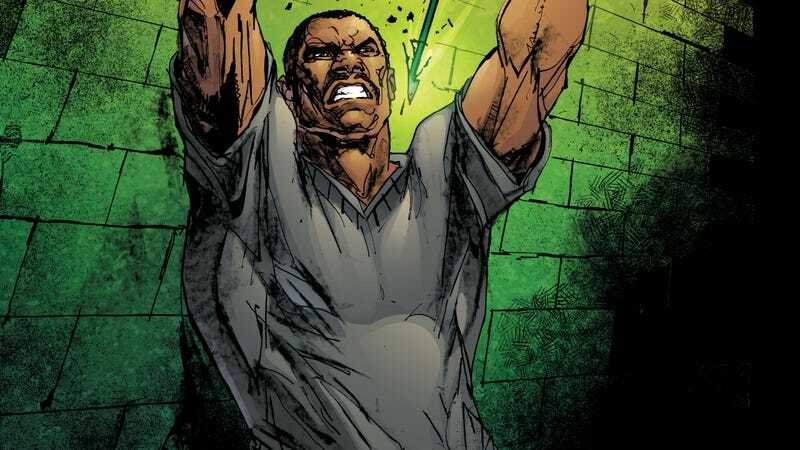 Rather than force Michael Cray’s blackness into every conversation he has in the comic, Hill made it a point that while his character is black, it isn’t all that the story is about. After all, Michael Cray is about a man who is hunting down a twisted version of the Flash. The psychology behind that alone is worth dissecting, and Hill manages to do that while making sure the reader is never misled into thinking that Michael Cray is anything but a black man.